TNT’s high-octane original series, LEVERAGE delivers more thrills when Season Four arrives on DVD July 17 from Twentieth Century Fox Home Entertainment. Everyone’s favorite gang of thieves, grifters and con artists is back and ready to help innocent victims by catching the bad guys. 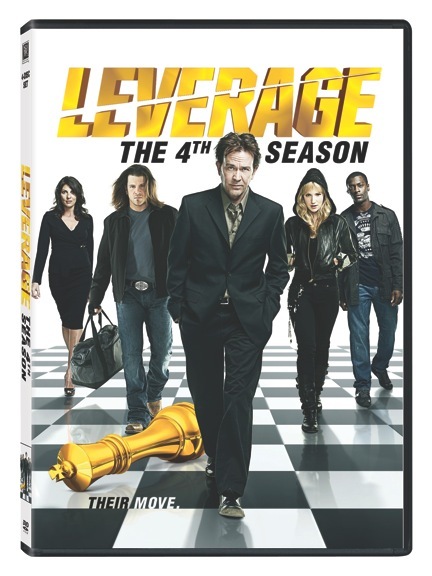 Featuring a superb ensemble cast including Timothy Hutton, Gina Bellman, Christian Kane, Beth Riesgraf and Aldis Hodge, LEVERAGE Season Four is a must-own on DVD, loaded with tons of explosive extras and never-before-seen footage. In Season Four of LEVERAGE, the team faces bigger challenges than ever before. Along with navigating Nate’s struggle with his inner demons, the team must deal with an overzealous public relations expert (guest star Michael Gladis); a millionaire who pays to have himself moved up on a heart-transplant waiting list; a woman who profits from people’s grief through a funeral scam; a corrupt agriculture corporation out to bury potato farmers; and a group trying to kill a World War II veteran (guest star Danny Glover). With the addition of their nemesis, insurance- investigator-turned-InterPOL-agent Jim Sterling (guest star Mark Sheppard) and an unknown spy who could unravel their whole operation, the team must tread carefully to complete their most difficult jobs. Enter for your chance to win a copy of Leverage Season 4 on DVD. Where to purchase: You are able to purchase Leverage: Season 4 from Amazon for $29.99. You are also able to pre-order.